A big thank you to all those who made it out last night for the premiere of "NYC is Handsome - On The Streets with Gabriel Frilando" a short film based in the boroughs of New York City. Known as "CheatDeathNYC" Gabriel Frilando shares his poetic, yet aggressive style of riding amid the streets of New York City. The project was a collaboration between Jonathan Chapman / JCP and Minneapolis based Handsome Cycles. It was a perfect evening to share the film, raise a few brews from Bauhaus, and indulge in tasty Italian eats from Vin's food truck. 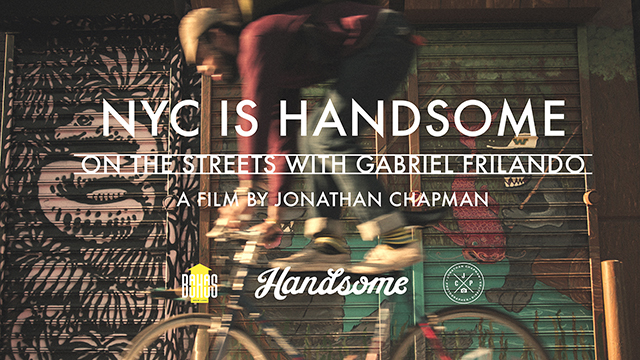 Welcome to the official teaser poster for the premiere of "NYC is Handsome - On The Streets with Gabriel Frilando" a short film based in the boroughs of New York City. The project is a collaboration between Jonathan Chapman / JCP and Minneapolis based Handsome Bicycles. The Premiere will be this Thursday, June 18th at Bauhaus Brew Labs at 8 p.m. 1315 Tyler St. NE, Minneapolis, MN 55413. *The film will premiere at 8pm and play again at 9pm & 10pm. Free Admission - All are welcome to come hang out with us. It will be a fun, casual gathering where you can enjoy a tasty brew, watch the NYC is Handsome film, delve into a few Italian food offerings from Vin's food truck, and treat your ears to the sounds of Ditchweed who will be there bringing their folky, bluegrass covers of 80s power ballads to keep us all going. Not too shabby for a Thursday night. Hope to see you there! If you can't make it out to the event you can check back here for the full edit this Friday. Thanks to Matt Thompson and the crew at Knock inc. for their support! Keep your eyes peeled on the JCP Instagram account for another #JCPBlink sneak peek at what's to come. If you missed the first Blink last week you can check it out here. Summer in Minnesota, the good old summertime indeed. It's easy enough to get away for a few days with numerous small towns just a short drive from city life here in Minneapolis. Lanesboro is one such town in Southeastern Minnesota set amid an area known as Bluff Country, part of the Driftless Region of rolling hills and pastoral landscapes. This imagery is quite personal in nature; photographs from a weekend get-away with my wife Michelle. We set out driving my "new" 1965 Ford F100 truck on a Lanesboro-bound weekend adventure. The morning these images were made could not have been more ideal. We woke with the sun, set out driving upon worn and winding roads, and took a hillside break overlooking a picturesque valley. While the warm sun was soaking and filling our spirits, the drive back into Lanesboro wasn't nearly as calm and carefree. We didn't get lost, but we suddenly found ourselves struggling with an old engine that sometimes could and sometimes couldn't. The truck began stalling which grew more frequently with each passing mile. The fact that we were in hill country saved us as we literally coasted back into the heart of downtown Lanesboro. The remaining hours of the morning involved conversations and inquiries with locals to source a mechanic who might help diagnose and fix our ailing mode of transportation. Luck wouldn't have it in our case, as it was a Sunday and the following day was July 4th. From what we could gather there wouldn't be anyone available for at least a few days. In the end, it was a waitress who came to our rescue. She overheard us bouncing ideas and commented that she was heading back to Minneapolis later that afternoon. We gladly hitched a ride back to our doorstep, coincidentally less than a mile from where she was headed. We returned later that week to retrieve the truck after a minor repair. The mechanic seemed more excited to tinker on a vintage truck than to log hours for a costly repair. What we didn't mind was another venture back to Lanesboro. The town, the people, the time of year, and backdrop for this seemingly extended weekend could not have been richer. As with most adventures, whether it truly involves getting lost or off track there is often an upside to a change of plans and what initially seems like adversity. I'd argue that car trouble on a desolate road is a small price to pay for a good story and some great memories.